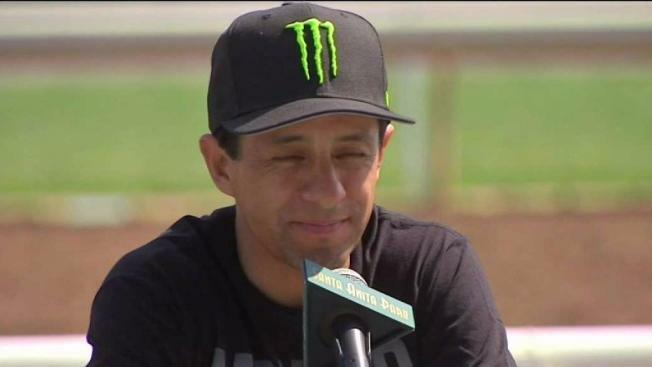 Jockey Victor Espinoza was injured Sunday after the horse he was riding at the Del Mar racetrack collapsed and died instantly during morning training. The horse’s owner, Brian Trump, said Bobby Abu Dhabi went into cardiac arrest, fell and died with Espinoza onboard at about 9 a.m.
Espinoza lay motionless for several minutes after being thrown from the horse between the sixteenth pole and the wire before being taken to the hospital. The jockey suffered a spinal fracture of the C3 vertebra near the neck and a "stinger" to the left shoulder and arm, causing shoulder pain and numbness. By Monday, he was moved out of the intensive care unit and was up and walking, according to the hospital. He will remain under observation at the hospital for a few more days before being released. Espinoza will miss the rest of the Del Mar season. The doctor and nurses are happy with his progress, Espinoza's agent Brian Beach told NBC 7 Monday. Victor’s condition has improved today to “stable” . He has been up and walking but they are going to hold him in the hospital a few more days for more observation. He will be moved from ICU later today but unfortunately will miss the remainder of the 2018 Del Mar meeting. "It looks like we dodged a bullet," Beach added. The public was not at the track at the time of the accident because the gates didn't open until 12 p.m. Sunday. Four-year-old colt Bobby Abu Dhabi was training for the Bing Crosby Stakes next Saturday. Espinoza, 46, guided colt American Pharoah to a Triple Crown win in 2015. American Pharoah was trained by Bob Baffert who has a residence in San Diego and trains horses in Santa Anita Park north of LA. Espinoza has won the Kentucky Derby three times and the Preakness Stakes three times. Last year, he was inducted into the Thoroughbred Racing Hall of Fame.